Don’t miss your chance to win an Oklahoma storm on QuiBids. If you’ve ever been to the great state of Oklahoma, you know that it’s got some of the most crazy and intense storms in the world. For basketball fans, we’re currently known for the OKC Thunder, the Western Conference’s winningest team right now. But those who aren’t basketball fans might associate Oklahoma with a different kind of thunder – the kind you hear coming from the sky. As you’re probably already aware, QuiBids‘ offices are headquartered in Oklahoma. 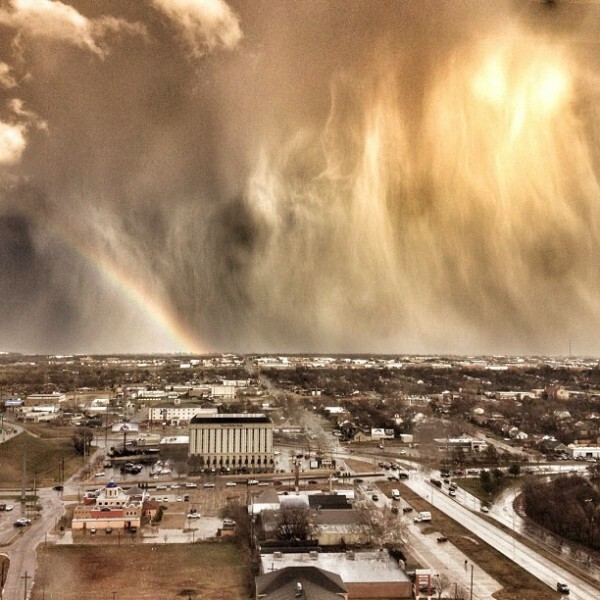 Just last month, I captured a photograph of an Oklahoma storm from my office window. The photo showed the back end of a fierce storm with a beautiful rainbow trailing behind it as if it were attached, like a tail. Within a matter of minutes the photo was shared thousands of times, and quickly achieved viral status. You can read more about that here. Recently, QuiBids enlisted the help of long-time meteorologist and OKC celebrity, Gary England. Gary spent weeks with QuiBids executives vigorously rehearsing his top-secret rain dance routine. He even shared some of his best-kept weather summoning secrets. After many sleepless nights of exec dance rehearsals with England as rain dance instructor, we’re proud to say that we’ve finally mastered the ability to create and customize storms for commercial purposes. So how do you get one of these Oklahoma storms for yourself? Today and today only, QuiBids will be auctioning off an Oklahoma Storm Bundle complete with rain, hail, thunder, lightning and more! Don’t be fooled by your local fluff storms; Oklahoma storms mean business. After doing extensive research (polling my office mates, Matt and Jill), I’ve created the chart below to help you better understand the differences of intensity between Oklahoma storms and storms located elsewhere. As you can see, Oklahoma Storms aren’t something to take lightly. What comes with this Oklahoma Storm Bundle? Location and path of the storm. Should a rainbow follow the storm? What can you do with an Oklahoma Storm? Use the storm as an excuse to get out of work. An Oklahoma Storm is a great way to rain on someone’s parade. Use it as an excuse to get out of class. Is your storm shelter business not doing well? Use this storm to increase demand and improve sales. An Oklahoma storm is a great way to cure your boredom. You could affect the outcome of an outdoor sporting event. It’s a great way to water your lawn. Follow my footsteps and capture an awesome photo. Test out your new umbrella. Test out your windshield wipers. Win money by betting against the weatherman. How would you use an Oklahoma Storm? Leave a comment and let us know.